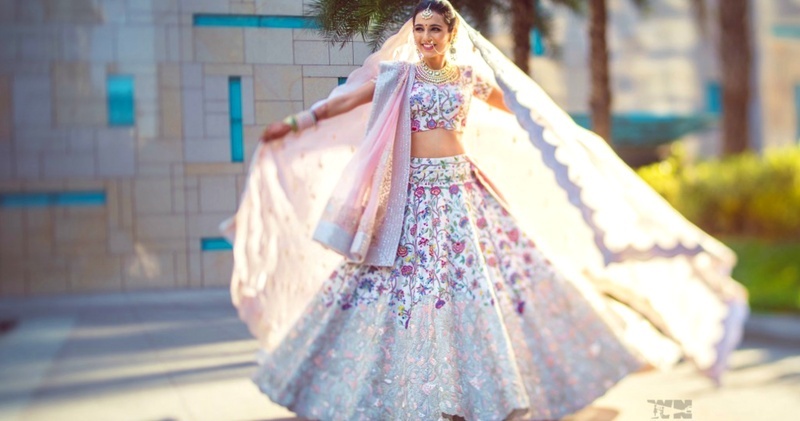 All the lehenga, makeup & styling tips for a short bride-to-be! Are you the kinds who gets 3-4 inches reduced from every pair of jeans you buy? Well, I feel you because shopping for any body-type isn't a piece-of-cake! Luckily enough, your wedding attires can be tailor made and hence will not make you fret much. The length of your lehenga is definitely an important factor in making you appear shorter or taller. So, make sure your lehenga skirt start around your navel and end a few inches below the feet. Although, just remember that, a lehenga skirt lehenga that’s worn way-too high on the waist with the midriff barely showing can make you look shorter. So, we suggest, have at least three-four inches of space between your blouse and lehenga! The length of your blouse can define how tall or short you look. So, ensure that your blouse is of the right length and in-sync with your figure. For instance, if you have a broad frame, you must go for a longer blouse and if you are lean you can opt for a shorter blouse. Avoid wearing high necks or bandhgalas as, they’ll make your neck look shorter and ruin your entire look. So, go for necklines that show off your collarbone and for the brides that are broad, opt for a U-shaped one or a V-neck. If you are someone who doesn’t like wearing very deep necks, opt for something that shows your neck and takes a break from your busy outfit. While getting your lehenga stitched, steer clear of those very broad borders as they’ll end up making you look shorter. So, go for narrow borders and give the broad, embroidered ones a miss. Colours play a very important role in making you look shorter or taller. When you wear too much color in one outfit, it gives an illusion of you looking shorter. Conversely, when there is one color from head to toe the eye flows down to it in one single swipe giving the illusion of height! Embroideries hold the power of making or breaking your bridal look. So if you’re short, try to go for embroideries that aren’t over the top or overpowering. Look for simpler pieces that have delicate yet striking embroidery on them. Gota-patti embroidery or even pointillist embroidery will look stunning on a short bride. This one’s very crucial. Your lehenga might just be a skirt at the end of the day, but it needs to fit your figure perfectly because it can make you look shorter and broader if its not the right fit! Although, make sure that your waist is rightly measured leaving you enough space to breathe. Don’t wear stiff fabrics as they restrict movement and look more clumsy. Most bridal outfits are generally heavy and have a fabric that’s not all that lightweight. But if you want to look even a wee bit taller, try getting your bridal outfit in a fabric that’s breezy and easy to style. Opt for silks, chiffons and georgettes as the base of your outfit. Also keep in mind the amount of can-can you want to put underneath your lehenga, because too much volume of the can-can can make you appear shorter than you are. While most brides are decked up in jewellery, if you’re not all that tall, you may want to balance your look a bit. If every piece is bold and big, it’s only going to make you look shorter. If you’re going for a bold pair of earrings, minimize the neck piece & vice versa. Shop with a supportive crew! The ‘Miss Nagging-Queen’ doesn't deserve a sacred spot on your ‘yay-or-nay’ team. Also, trust your consultant and don't be afraid to try on outfits and styles that he or she suggests! Layers might be ‘the trend’ right now, but I suggest you might want to give it a miss. If you’re short, you should avoid capes, extra dupattas and shrugs. Instead, you should opt for a lighter and less voluminous look, something like Masoom Minawala here, who’s got cape-style sleeves in her lehenga. The bride’s hairstyle plays an integral role too. To accentuate your face curves, you can go for a neatly tied or a high hair bun. With all the points being followed, this one is the most important on the list. That being said, you are ready to slay your D-day!